So what to do in the MLB offseason, especially if you’re not able to be in Florida (for instructs) or Arizona (for Arizona Fall League)? Have a minor league draft of course! We got 11 of our correspondents and one dynasty league nut (Brent) together to mock draft 360 prospects. Each person is drafting a roster made up of the following positions: 2 C, 1B, 2B, 3B, SS, CI, MI, 5 OF, 2 UTIL, 10 P and 5 bench players. Below is the first installment which covers the first 9 rounds (108 total selections). We’ve also included commentary from some of our guys on specific picks they wanted to focus on and explain their reasoning. Definitely let us know in the comments below which picks you’re liking, who reached too far, and what rosters are shaping up to be the best ones overall. Hit us up on Twitter too at any of their handles (shown below) or at @Prospects1500. Aaron Schuck (had to leave the draft after Round 1, Tony Bps took over this spot): Alex Kirilloff has quickly become my favorite prospect in all of minor league baseball. That is one of many reasons why I took him with the 10th overall pick. I love how the lefty can rip the ball to the right center gap against right handed pitchers and punch the ball out to left field against lefty pitchers. He puts the ball in play and gets on base. At 20-years-old, I still see plenty of room to add muscle to his 6’2″ frame. His power numbers will increase as he matures physically. He will not disappoint Twins fans when he arrives in Minnesota, which I think will be sooner than most anticipate. Michael Parnell: Brendan Rodgers, my first-round pick (1.11), remains the consensus top prospect for the Colorado Rockies and one of the best prospects in the minor leagues. But he hasn’t rocketed up the minors like some prominent top prospects. He had 17 homers, 62 RBI, 12 stolen bases and a slash line of .272/.337/.485 in 95 games this season at AA Hartford. He was promoted to AAA Albuquerque on July 29 where he hit no homers with 5 runs batted in and a .232 batting average in 19 games. The second-base job may be open in Colorado next season. Will Rodgers seize it in spring training? More likely he begins the year back in Albuquerque and makes his way to Denver during the summer. Just 22, he still projects as a top-12 prospect. But there are doubters who wonder how much upside there is. Tony Bps: My goal going into the draft was to select the players who I thought had the highest upside. I took over the team after the 1st round after the previous owner had taken Alex Kirilloff and he was a player I would have taken in the same exact spot (1.10). Once I saw a lot of hitters going, I decided to zag while everyone was zigging, so to speak. I took three straight pitchers in Jesus Luzardo (2.3), Sixto Sanchez (3.10) and Brent Honeywell (4.3). I’m super-high on all three, especially Luzardo. With his Tommy John Surgery behind him, he had a sensational year across three levels finishing the season at Triple-A. He tallied 109 1/3 innings, striking out 129 hitters with a 1.088 WHIP. Control is usually the last thing to return for a pitcher coming off the surgery, so seeing his low walks (30) convinced me to grab him. Ben Wilson: Andres Gimenez (3rd, 31 overall) represents one of the biggest prospect risers in 2018. Gimenez played a majority of the season at High-A, and put together an impressive showing in 37 games in AA Binghamton as a 19-year-old. I had the privilege of catching him play in Binghamton, and he dazzled in the box, on the bases, and in the field. Gimenez showed that he has the tools to grow into a potential 20 HR, 30 SB force while boasting a plus hit tool and solid OBP skills. He also serves as a reminder that defense impacts the fantasy game because he will be an impact MLB player in the middle infield at either 2B or SS. Many have not caught up to taking his power potential seriously, but he can ascend to top 10 overall prospect in the game status in 2019 with another step forward. Currently in the AFL, look for him to break out in the power department on a bigger stage against more advanced competition. Once he does, 31 may end up looking like a modest placement. Scott Greene: Before I talk about Estevan Florial I wanted to quickly mention my first round thinking. I was hoping Jo Adell fell to me at 8th overall. He did, and then I didn’t take him. I decided to go with uber-prospect Wander Franco and let Adell fall to the next lucky guy (Jake got him 4 picks later at 12th overall). I haven’t seen Franco live in person yet, but from all accounts he’s so good and so young! Upside! Not that Adell doesn’t because all he’s done is rake and move up the ladder quickly. Having said that, I’m a big fan of Yankees outfielder Florial and was ready to pick him in the 3rd round. Again I swerved from my plan and took 2018 draftee Nolan Gorman with that spot and promised I wouldn’t let Florial go if he fell to me in the 4th. So there you go. That’s when I snagged him and I believe 41st overall is great value for a kid who could be Top 25 overall. I saw him this past April in Fort Myers at a Miracle/Tarpons Florida State League game and I could tell his makeup at the plate will play as he matures. Yes he struggled some in 2018 and has had issues recognizing pitches, but the tools are there and I’m excited to see how he rebounds in 2019, probably starting out at High-A Tampa and maybe I’ll get to see him in Hartford if he gets promoted to AA Trenton. Stoffer Cochran: I was going to prioritize pitching with my 4th round pick but Peter Alonso was looking for more people to throw him the ball and after my 3rd round pick, Gimenez, Gorman, Urias, and Hampson all left the board. So I went and searched for some infield help and the decision came down to 3 players. Ke’Bryan Hayes, Nick Madrigal, and Ryan Mountcastle. (If any of the ones I didn’t pick where still available in Round 5 they would have been selected then.) I ended up selecting Hayes with this pick and I couldn’t be happier with my infield at this point. I have Alonso at first, Bichette at second and Hayes at third. Hayes got his first taste of Double-A last year and hit .293 with a .375 OBP. He stole 12 bases out of 17 attempts and only struck out 19% of the time. He hit 7 homers, 7 triples and 31 doubles letting me know that his power stroke is legit. He has good pedigree as the son of Charlie Hayes and looks like a lock to stick at third. I have no regrets with this pick at all. Ryan James: Having the first overall pick, the options were pretty limited. I really had a list of one. Not that I’m the least bit unhappy to get Vladimir Guerrero Jr., but he’s not who I’m most excited about. That distinction would go to my fourth round selection Dylan Cease. In 2018, Cease showed that the hype is very much for real. After dominating High-A Winston-Salem, Cease really turned it up in his 10 start stint in Double-A Birmingham, posting a 1.72 ERA, a 0.99 WHIP and a .168 BAA, while striking out 13.4 batters per 9 innings. Cease is certainly a potential future ace for the White Sox. Andy Patton: As a firm believer in TINSTAAPP (there is no such thing as a pitching prospect) I planned to go very hitter-heavy early in the draft. It’s clear I was not the only one with that thought however, and I ended up using two of my first six picks on pitching prospects that I felt had fallen too far for me to ignore them. The rest of my squad is made up primarily of big league ready prospects, with three of the four already having some experience in the show. However, it’s the non-pitching, non-big league prospect I want to talk about: Dodgers infielder Gavin Lux, who I snagged with the sixth pick of the fifth round, number 54 overall. Lux is a 20-year-old middle infielder who crushed the ball at both High-A and Double-A last season, hitting .324 at each level with 15 home runs and 13 stolen bases combined. While there are concerns about his defense at short, he has all the tools to be an above average defensive second baseman. At just 20-years-old, Lux is a building block up the middle for years to come, and I was happy to have him in the fifth round. Tim Smith: I was a bit surprised to see Touki Toussaint available at this point. His curve ball has always been a thing of beauty and he showed glimpses of putting it all together this year. When prospects debut and don’t immediately set the major leagues on fire, they often become undervalued the following year. Hopefully Toussaint is able to build on his debut and become a prominent member of the Braves rotation in 2019. Matt Hammerling: I thought I’d be taking Wander Franco at 1.3, but I was happy to get Eloy Jimenez there. He should be hitting homers in bunches by June. I believe selecting Austin Riley 22nd overall gives me the best 1-2 power punch in the mock. I considered a pitcher like Mize or Kopech in the 3rd, but ended up stacking some lumber with Kieboom. I like my top 3 bats, and shouldn’t have to wait too long to have them all slugging in the majors. Got the arm I wanted in Round 4 in AJ Puk. He’s coming off Tommy John, but has electric stuff, huge upside and should contribute in 2019. My 5th rounder Luis Garcia is by far the youngest player I’ve taken so far. In fact he was the youngest player in the 2018 Futures Game and more than held his own as one of the youngest players in the Sally and Carolina League. Then I had some fun with my 70th overall 6th round pick Daulton Varsho. He had a successful 2018 season, and I think if he has a good performance in the AFL he can vault up prospect lists. I think he has the potential to have Craig Biggio-esque 20 HR /20+SB seasons in the majors. And I think he stays at catcher making his fantasy owners very happy. Brent Philmon: For those that know me well, in all my years of playing fantasy baseball, I have always made starting pitching a priority. I think so many people do the opposite, they load up their teams with the big bats, and then worry about pitching later. Thus I feel that focus on starting pitching more often than not gives me somewhat of a competitive advantage coming out of the gates. This prospect mock draft is no different for me. In the first 7 rounds, I have taken 3 strong pitching prospects. My 7th round pick is a big young guy – Michel Baez, Padres RHP pitching prospect, and who I feel is a top 50 prospect. To further drill down on my love of starting pitching, I especially love the big & tall flamethrowers, and Baez certainly fits the bill, at 6’8” and 225 lbs. He’s got a strong fastball that hits the upper 90s on a regular basis, which combined with an upper 80s slider, makes him an imposing figure on the mound. He dominated A-ball, and while not as effective in AA, I’m sure adjustments will be made, and he’ll excel there. I look to see him be a #2 or #3 starter for the Padres in the next couple of years. I personally feel like he was a steal at the 77th overall pick. Jake Berry: I love being at the first turn. For me, Jo Adell and Keston Hiura were no-brainers at 1.12 and 2.1. But, I think the real steals were in the turn of the seventh and eighth rounds. Since this is a slow draft, I go back and check on the picks periodically and I was blown away when Jahmai Jones was still there at 7.12 and pleasantly surprised with Seuly Matias at 8.1. Keep an eye out for Matias in your dynasty leagues. 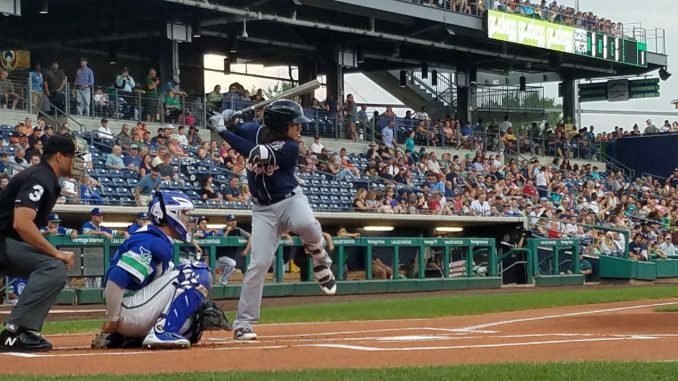 The 20-year-old Dominican power hitter popped up on many folks’ radar when he appeared on the Futures Game roster, but he is more than likely still available in shallow leagues and may be able to be had for cheap in deeper formats. He has the potential to be a guy you look back on as a steal in 3 years or so. The draft is ongoing and “open to the public” per se. Each writer is tweeting out their picks which are being retweeted from our Prospects1500 Twitter account, and you can follow along if you want on our Google draft spreadsheet. We’re in the 10th round (as of Saturday 10/13) and will be drafting prospects through 30 rounds.